The Saratoga Branch opened in 1908. 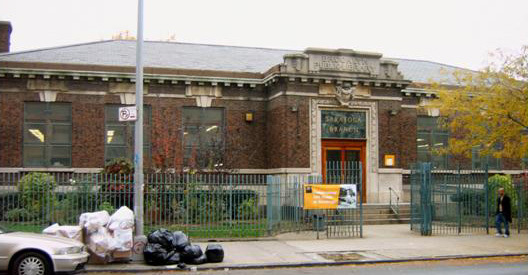 This Classical Revival Carnegie library, with a Spanish-tile roof, replaced an earlier branch on Putnam Avenue. The 10,000 square-foot building underwent major renovations in 1958, 1974, and 1990. In 1997, Saratoga became the first New York City Carnegie library to receive a designed garden by the Horticulture Society of New York.